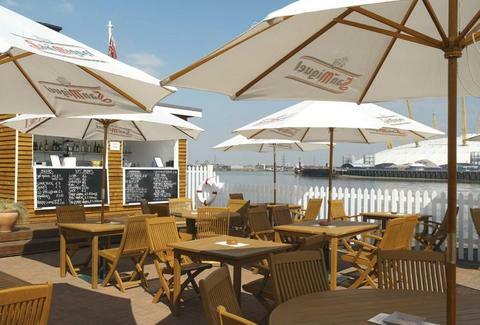 Returning Thursday as an open-air seasonal extension to the Thames-abutting Gun Pub, this al fresco southern Portuguese resto/grill serves fresh fish from Billingsgate cooked to order on an open grill. The new menu kicks off with Portuguese chourico sautéed in red wine, then moves up to whole fish (dourade, red snapper, sea bass...) and specials such as squid in tomato (w/ Scotch whisky & cream sauce and buttered rice), and a monkfish & salmon "espetada", described as a "hanging kebab" -- punishment it deserves for the unpardonable crime of not being served "with chilli sauce, mate? ".